Stem-Changing Verbs Congratulations! Youve graduated to the next major verb concept, the stem- changing verbs. 2 Stem-Changing Verbs Congratulations! Youve graduated to the next major verb concept, the stem- changing verbs. 3 Remember…? 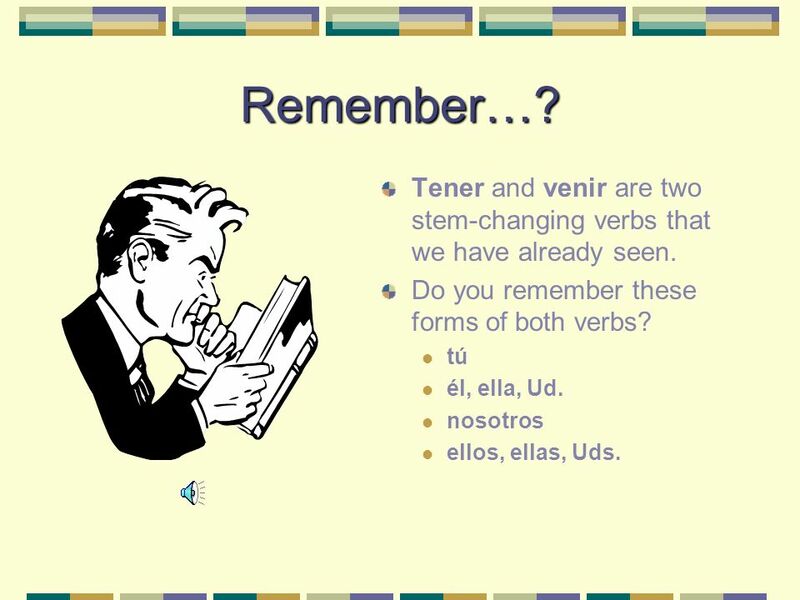 Tener and venir are two stem-changing verbs that we have already seen. 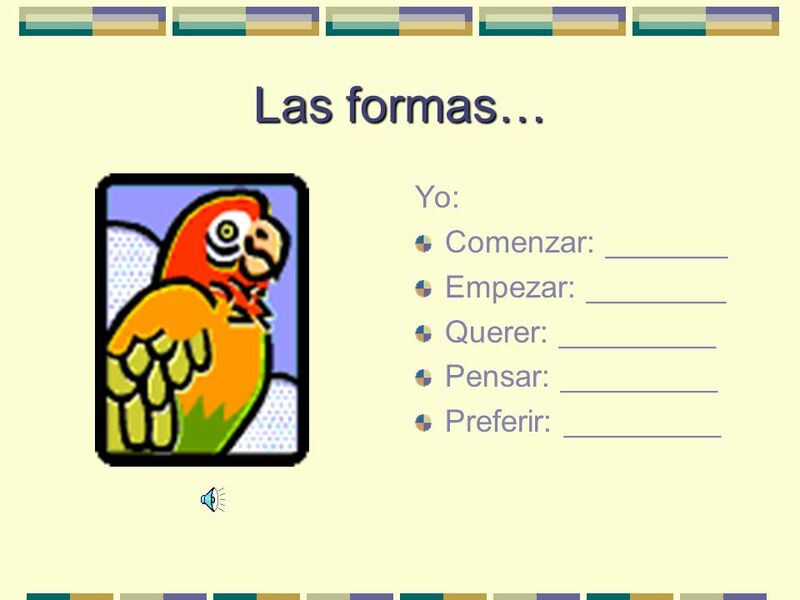 Do you remember these forms of both verbs? tú él, ella, Ud. nosotros ellos, ellas, Uds. 5 What happened? 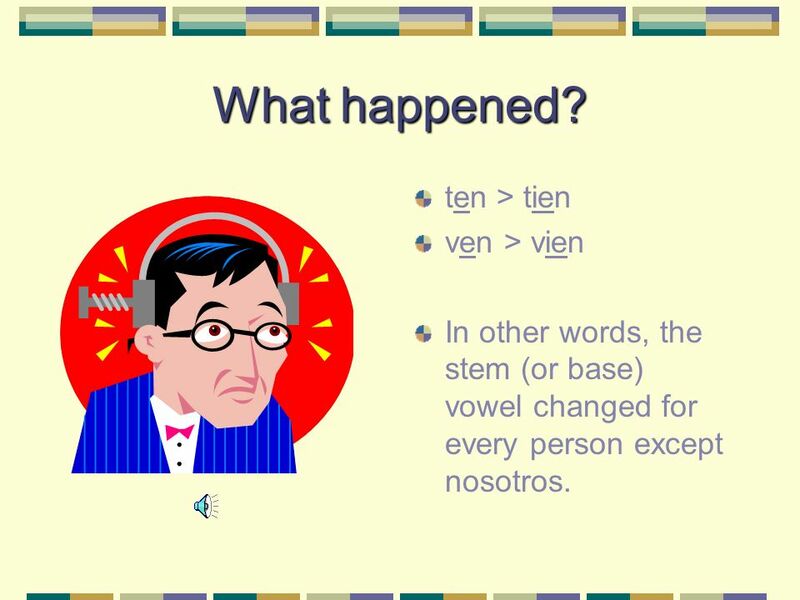 ten > tien ven > vien In other words, the stem (or base) vowel changed for every person except nosotros. 6 Prefieres té o café? Lets look at a typical stem- changing verb: preferir. 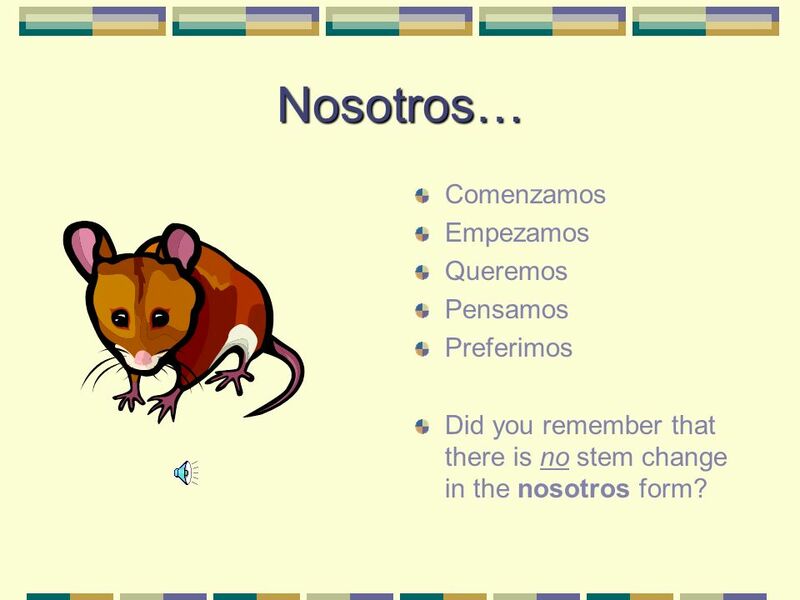 The stem changes from – e- to – ie- in all forms except nosotros. 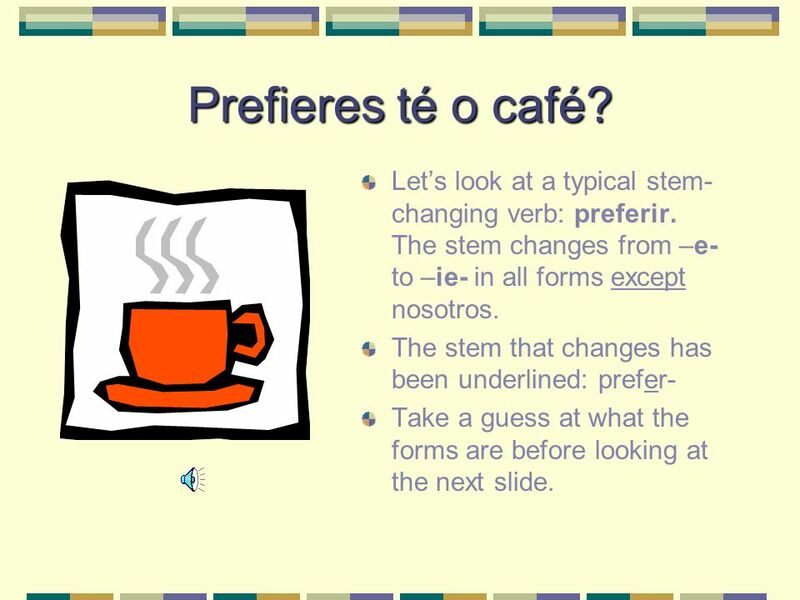 The stem that changes has been underlined: prefer- Take a guess at what the forms are before looking at the next slide. 16 Nosotros… Comenzamos Empezamos Queremos Pensamos Preferimos Did you remember that there is no stem change in the nosotros form? 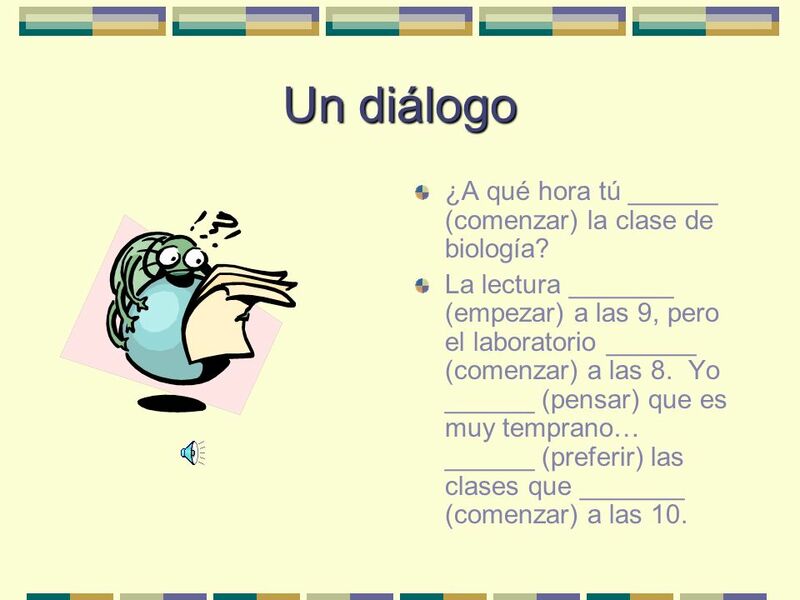 17 Un diálogo ¿A qué hora tú ______ (comenzar) la clase de biología? La lectura _______ (empezar) a las 9, pero el laboratorio ______ (comenzar) a las 8. 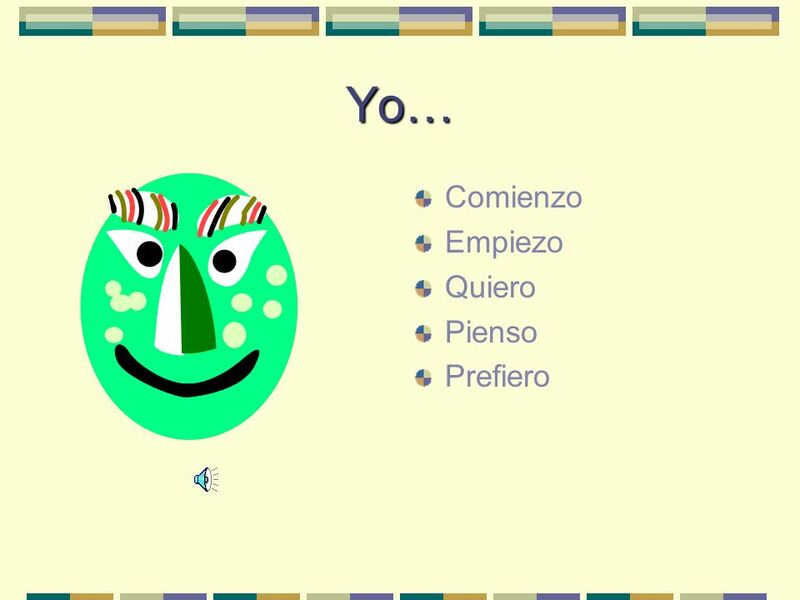 Yo ______ (pensar) que es muy temprano… ______ (preferir) las clases que _______ (comenzar) a las 10. 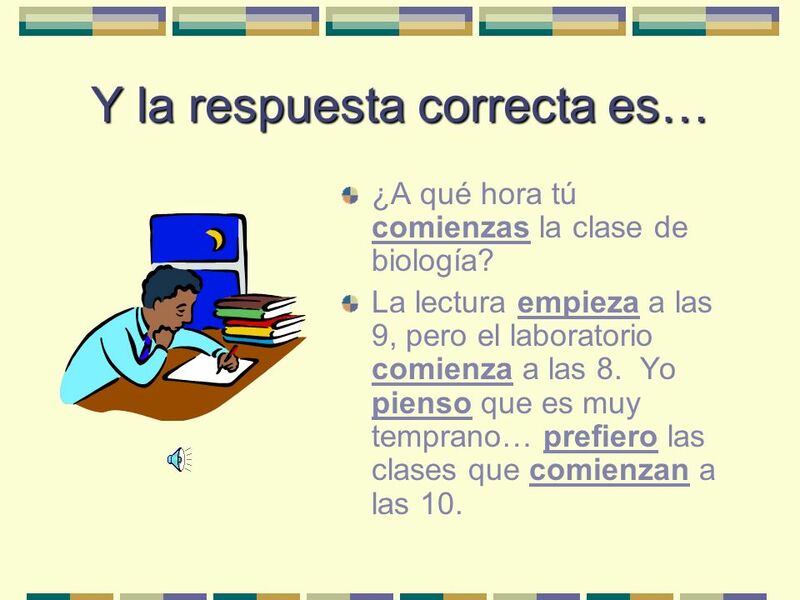 18 Y la respuesta correcta es… ¿A qué hora tú comienzas la clase de biología? La lectura empieza a las 9, pero el laboratorio comienza a las 8. Yo pienso que es muy temprano… prefiero las clases que comienzan a las 10. 19 Onward! 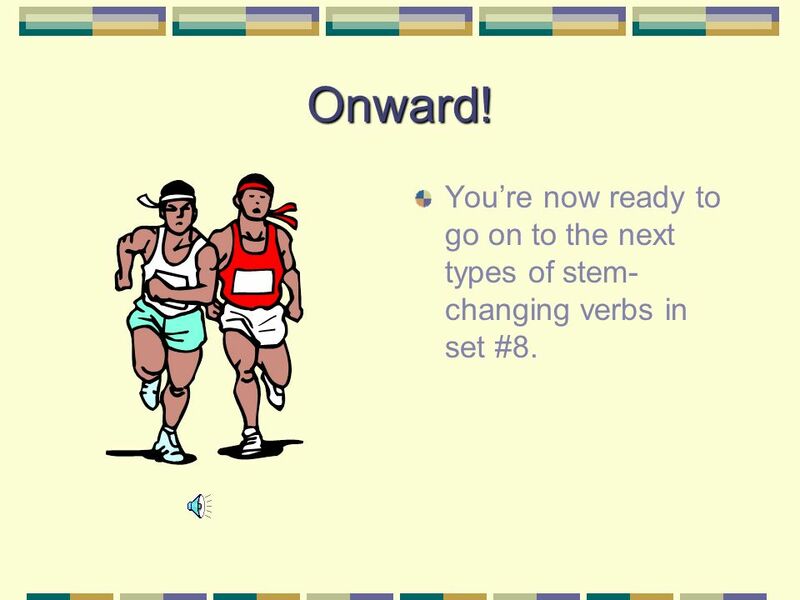 Youre now ready to go on to the next types of stem- changing verbs in set #8. 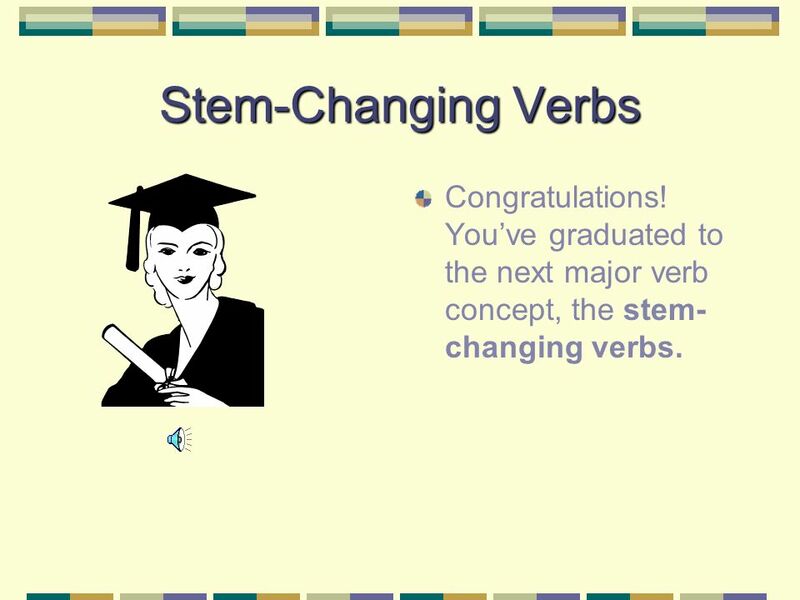 Descargar ppt "Stem-Changing Verbs Congratulations! Youve graduated to the next major verb concept, the stem- changing verbs." More Stem-Changing Verbs! There are two more groups of stem- changing verbs that we want to learn: the e > i and the o > ue. FROM e TO ie STEM-CHANGING VERBS. 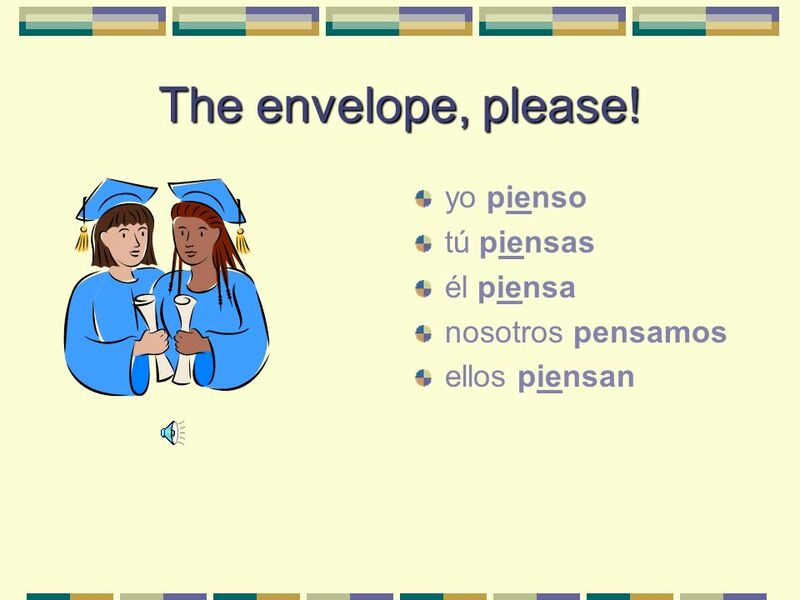 With this group of stem-changing verbs, the letter e in the stem changes to ie in all forms except the nosotros and. 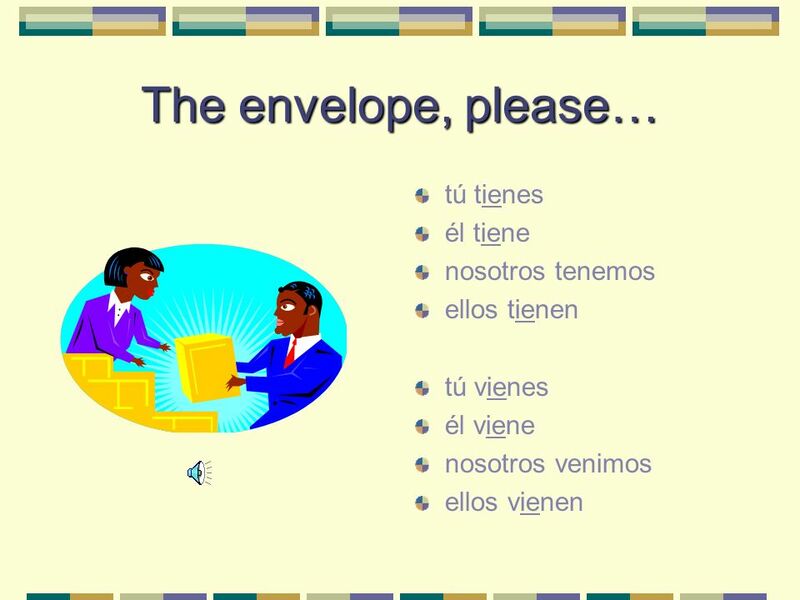 Present Subjunctive of Stem-Changing Verbs You know that stem-changing verbs in the present indicative have a stem-change in all forms except and. nosotrosvosotros. Stem-Changing Verbs e – ie. E  IE BOOT VERBS. 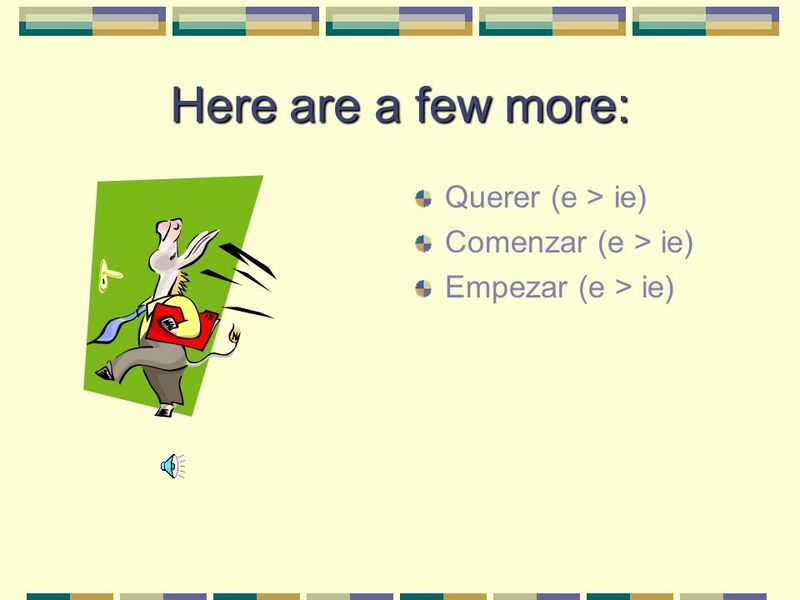 You have already learned 2 e  ie verbs: tener (to have) venir (to come) These verbs are LOW TOP BOOT VERBS. The “YO” form is NOT in. 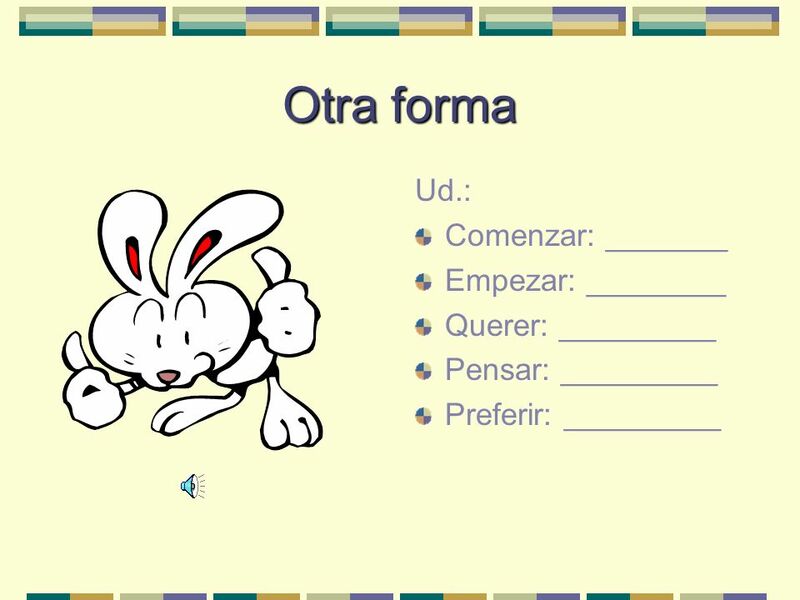 Yo- GO verbs & irregulars Etapa Preliminar / Repaso. Stem changing Verbs AKA Boot Verbs A verb that ends in AR, ER, IR is called an _______________. When you drop the -AR, -ER or -IR, what is left is called. 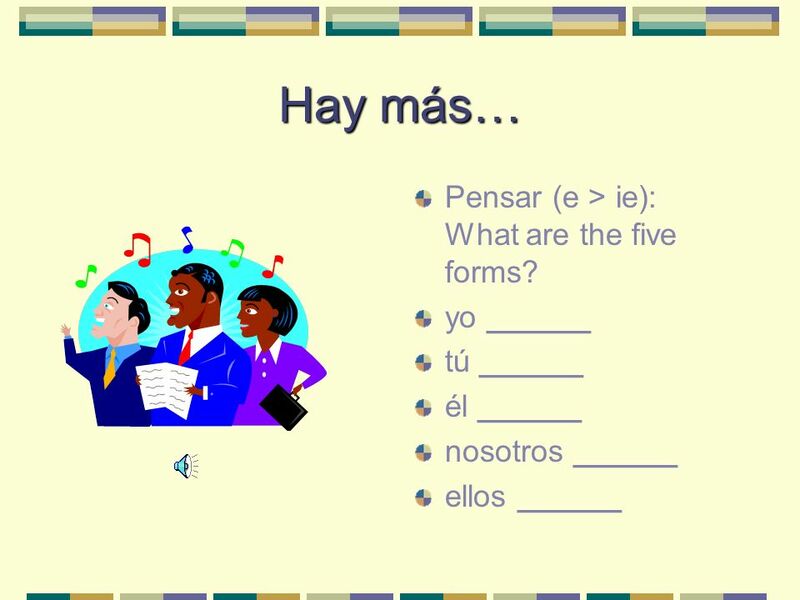 Español 2-2 Sra. Carpinella. 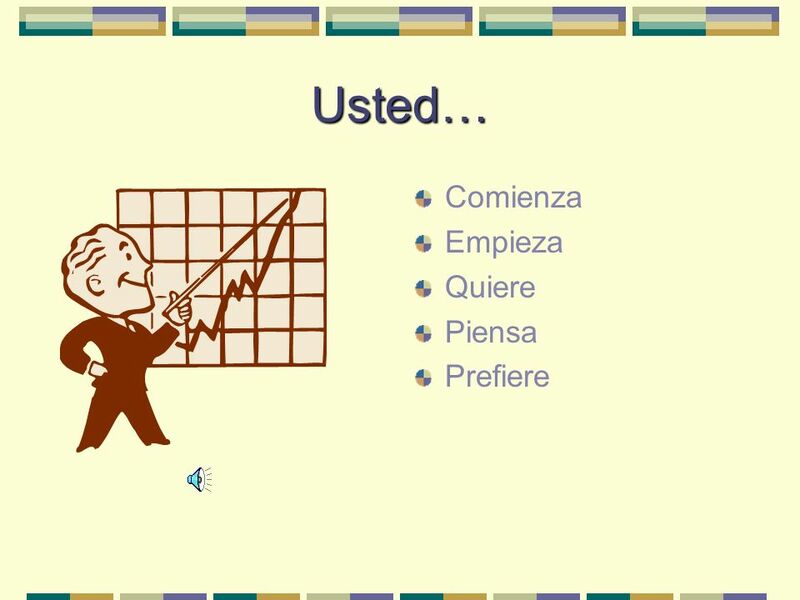  In Spanish, there are several verbs that have spelling changes in the stem of the word.  The stem is the part of the word. 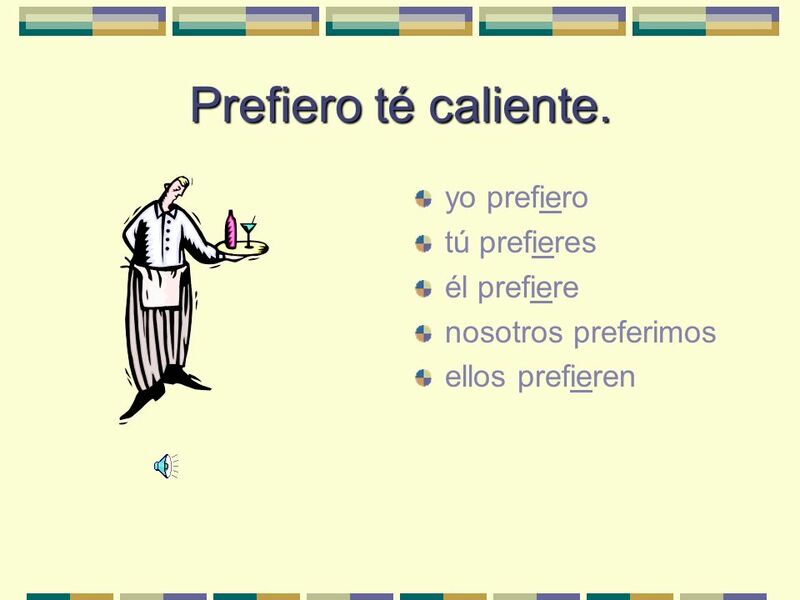 Pensar, Querer, and Preferir PREFERIR n Here we will learn the verb PREFERIR, which means “to prefer.” n But before we do, let’s look at 2 other verbs.